Operant Subjectivity: An Overview of the Statistical Techniques in Q Methodology: Is There a Better Way of Doing Q Analysis? An Overview of the Statistical Techniques in Q Methodology: Is There a Better Way of Doing Q Analysis? 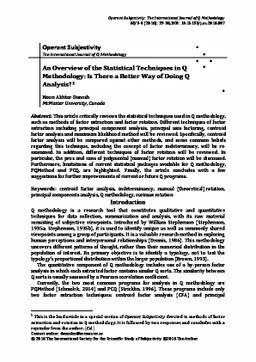 This article critically reviews the statistical techniques used in Q methodology, such as methods of factor extraction and factor rotation. Different techniques of factor extraction including principal component analysis, principal axis factoring, centroid factor analysis and maximum likelihood method will be reviewed. Specifically, centroid factor analysis will be compared against other methods, and some common beliefs regarding this technique, including the concept of factor indeterminacy, will be re- examined. In addition, different techniques of factor rotation will be reviewed. In particular, the pros and cons of judgmental (manual) factor rotation will be discussed. Furthermore, limitations of current statistical packages available for Q methodology, PQMethod and PCQ, are highlighted. Finally, the article concludes with a few suggestions for further improvements of current or future Q programs.